BrainBows: Genetically engineering mice so that their brain cells express different combinations of fluorescent colors reveals the brain’s complicated anatomy. 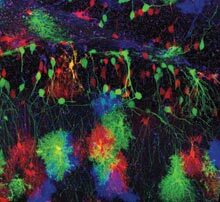 In the image round green neurons are interspersed with diffuse support cells called astrocytes. Displayed on Jeff Lichtman’s computer screen in his office at Harvard University is what appears to be an elegant drawing of a tree. Thin multicolored lines snake upward in parallel, then branch out in twos and threes, their tips capped by tiny leaves. Lichtman is a neuroscientist, and the image is the first comprehensive wiring diagram of part of the mammalian nervous system. The lines denote axons, the long, hairlike extensions of nerve cells that transmit signals from one neuron to the next; the leaves are synapses, the connections that the axons make with other neurons or muscle cells. Although researchers have been studying neural connectivity for decades, existing tools don’t offer the resolution needed to reveal how the brain works. In particular, scientists haven’t been able to generate a detailed picture of the hundreds of millions of neurons in the brain, or of the connections between them. Lichtman’s technology–developed in collaboration with Jean Livet, a former postdoc in his lab, and Joshua Sanes, director of the Center for Brain Science at Harvard–paints nerve cells in nearly 100 colors, allowing scientists to see at a glance where each axon leads. Understanding this wiring should shed light on how information is processed and transferred between different brain areas. To create their broad palette, ­Lichtman and his colleagues genetically engineered mice to carry multiple copies of genes for three proteins that fluoresce in different colors–yellow, red, or cyan. The mice also carry DNA encoding an enzyme that randomly rearranges these genes so that individual nerve cells produce an arbitrary combination of the fluorescent proteins, creating a rainbow of hues. Then the researchers use fluorescence microscopy to visualize the cells.